High-yield municipal bond income seems like a dream come true in today’s market. The ability to capture a 4%-plus income stream with little taxable impact in a strongly trending credit environment is the ideal situation for many retirees. This is particularly true for investors who have more money stashed away in taxable trusts and brokerage portfolios than traditional retirement accounts. However, despite the relatively benign price action over the past six months, there are worrisome signs of fundamental headwinds in this sector. Illinois recently received a downgrade in its credit rating status to one notch above “junk” level and Puerto Rico is still embattled over its gigantic debt restructuring deal as well. These may well end up being ominous signs of future volatility in this sector that many may not be prepared for. 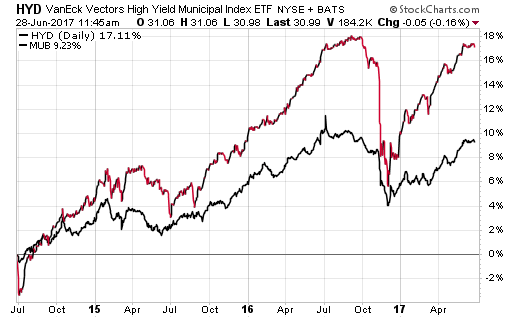 One of my favorite index proxies for the high-yield muni bond market is the VanEck Vectors High-Yield Municipal Index ETF (NYSEARCA:HYD). This fund has $2.2 billion dedicated to a diverse mix of over 1,500 long-term, tax-exempt bonds with a 30-day SEC yield of 4.06%. According to the fund company website, that translates to a taxable equivalent yield of 6.73% for the highest Federal tax bracket. This exchange-traded fund charges a modest expense ratio of 0.35% for access to the strategy. One of the most important aspects of analyzing any high-yield or aggressive-income ETF is noting where the highest sector or regional concentrations are located. For HYD, the top state allocations are California (16%), Illinois (12%) and New York (8.7%). In this index, Puerto Rico exposure is limited to just 1.2% of the portfolio. The chart below shows a three-year overlay of HYD versus an investment-grade equivalent in the iShares National Muni Bond ETF (NYSEARCA:MUB). Both funds have experienced relatively similar trends, with HYD obviously showing much greater volatility overall. That big plunge around the presidential election is notable in that HYD fell approximately 12% in just a couple of months. It’s easy to see how quickly contractions of this nature can escalate when credit-sensitive investments are stressed via technical or fundamental means. This can be further exacerbated by the overall interest rate sensitivity of the underlying portfolio as well. Many high-yield indices achieve this target by stretching to the longest-dated securities with the highest interest rate risk. Another top fund in this category is the SPDR Nuveen S&P High Yield Municipal Bond ETF (NYSEARCA:HYMB), which has $600 million under management. Puerto Rico accounts for over 9% of the HYMB index, with Illinois taking the next place at 8.36%. Some may be inclined to view the current state of calm in the high-yield credit markets as a sign of abundant liquidity and moderated risk. That’s exactly the type of environment that smart, active investors can use to their advantage. Starting to size down overweight positions or thinking about alternative income-producing assets may yield better overall diversification and capital preservation through the next cycle. High-yield municipal bond funds can offer very attractive yields and capital appreciation potential in a rising risk asset environment. However, they are best purchased during periods of stress and slowly exited during periods of tranquility. This counterintuitive mindset can help alleviate the urge to liquidate at inopportune times and provide better overall risk management. David Fabian is Managing Partner and Chief Operations Officer of FMD Capital Management. To get more investor insights from FMD Capital, visit their blog. Learn More: Why I love ETFs, And You Should Too. 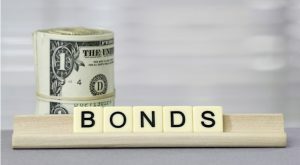 Article printed from InvestorPlace Media, https://investorplace.com/2017/06/keep-a-close-eye-on-high-yield-municipal-bond-etfs/.